Imagine yourself scrolling through your Instagram feed. Passing pictures of friends’ birthday parties and beach getaways, intermixed with short videos and photos from your favorite Instagram stars sporting the hottest clothes and products. You pause when you see your favorite influencer upload a photo in a Prada outfit that you wish you could afford. But what if that picture isn’t of a real person, and that Prada dress is just a digital rendering of the real thing. Would this influencer still hold influence? In mid-2018, the secret was out for 19 year old LA native, Miquela Sousa or @lilmiquela, when she revealed to her fans that she was a work of artificial intelligence (AI). This CGI rendered robot (her words) is an Instagram influencer, model and musician. She has recently collaborated with Prada on social media, taking over their Instagram as a promotional stunt for Prada’s 2018-2019 Fall collection. Miquela has also produced her own album (which is better than expected), having over 600k views on her debut song “Not Mine” on Youtube. She actively engages with her followers, and seems to form her own opinions about the world and current event topics. There is still confusion around why her persona was created and where her features and voice came from, but from what we do know, she was created by an LA based technology start up, called Brud. There is a fictional background thrown into her origin story, but Brud seems to be the company that is taking credit for her creation and management. Even though Miquela and Brud have severed ties after the truth was revealed about her upbringing, they still seem to have an active relationship communicating through social platforms. 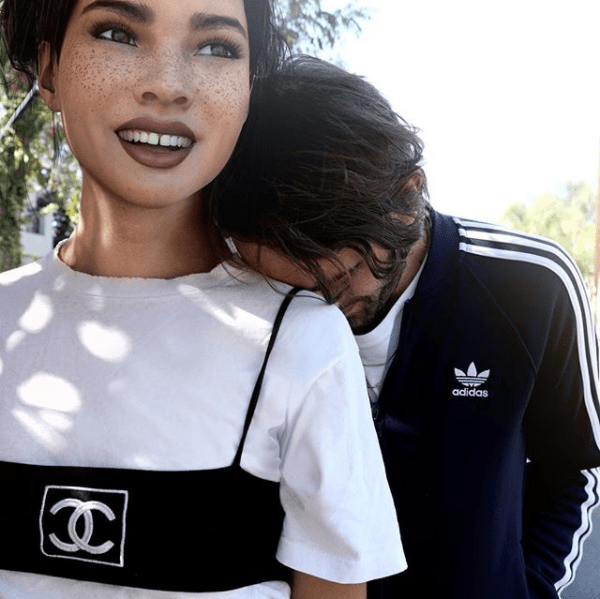 Currently, Miquela doesn’t get paid for collaborations or brands she advertises on her page, but as her influence and followers grow that may soon change. In light of this news, we can’t help but think, what does this mean for influencer marketing moving forward or better yet, AI in the marketing space? Most people don’t believe that the entrance of this new age influencer will change the market for human influencers. AI influencers lack the ability to bring to life the reviews and experiences followers trust when considering a brand/product, since they can’t to rate products based on real life usage experience. But this isn’t the first time we have seen these “virtual celebrities.” One example is musician Damon Albarn and artist Jamie Hewlett’s creation: Gorillaz, a virtual band created in the late 1990s. Gorillaz was such a success they went off the win a Grammy in 2006. Since the Gorillaz bandmates were only mere cartoons that were limited to music videos and album covers, the emergence of artificial influencers breaks through the “performance” and provides unique interactions with the public. With AI entering this space, we, as advertisers, could see this as a tool to help a brand expand their persona. This kind of influencer can build a trusted following that is more genuine and less self-promoting than traditional advertising. Also, virtual influencers could help gain more insight into the target audience’s wants and needs for a brand/product. Through a digital avatar, consumers may feel less ashamed filtering their thoughts or questions, enabling them to create genuine connections within the community and with the avatar and, ultimately, with the brand. If AI influencers are viewed in some way as a brand extension then maybe we could see more of these influencers in the market in the near future.